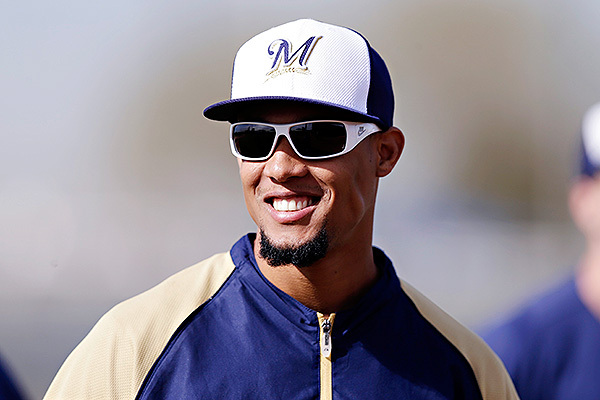 Carlos Gomez has decided to settle down, and not just at the plate. While the buzz so far this spring has been his five walks and .529/.652/.765 triple slash line, the 27-year-old outfielder had another reason to smile on Wednesday. The Brewers rewarded Gomez for last year’s strong second half with a 3-year, $24M extension. According to Tom Haudricourt, the deal will pay Gomez $7 million in 2014, $8 million in 2015 and $9 million in 2016. Gomez’s hot streak in 2012 apparently played into Doug Melvin’s decision. The GM said Gomez has recently “come into his own.” That’s true at least offensively, but Gomez has always been a superior defender in center, and so long as he continues to roam the outfield, it look like he’ll be worth the money on defense alone. Which brings an interesting point: why would Gomez, one year shy of free agency, decide to sign a below-market deal now? And make no mistake, it is below market. B.J. Upton, with much better power but his own plate discipline problems, just inked a 5-year, $75M deal with the Braves. Gomez was never going to command that much, but with another season like last year’s, a 3-year deal might well have topped $40M. The move is uncharacteristic-to say the least-of Gomez’s agent, Scott Boras, who sure enjoys the bidding war that free agency sometimes brings. One possibility is that Boras doesn’t necessarily buy in to Gomez’s second half, and wants to “sell high” while Gomez is also having a hot spring. Or maybe the suggestion came directly from Gomez, who sees an opportunity for financial security and stability in Milwaukee. Whatever the reason, the Brewers are getting a fairly good deal on a young middle defender.